I love experimenting in the kitchen with new recipes, but I also rely on tried-and-true meals that I can make with minimal effort. 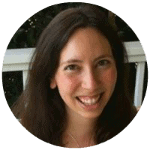 I do meal plan, so generally I mark down a couple of new recipes I’d like to try that month, and then fill the rest of the meal slots with my repertoire. 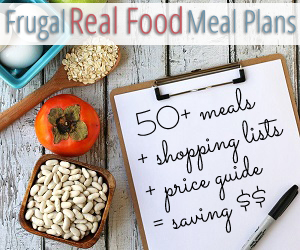 This meal plan might work for you even if you don’t fit all of the bullet points above–you can always find ways to add meat or use dairy substitutions, for instance. I think it’s interesting (and helpful) to see what other families actually eat, not just what a magazine or cookbook suggests you eat. This is what we really eat, with links to some of our family’s favourite recipes. To keep things frugal, we have beans and rice at least once, with leftovers throughout the week. Sometimes I mix it up a bit by serving lentils instead, like in this meal plan. We also do 85% of our grocery shopping at Aldi. If you haven’t been there please check it out! The prices are fabulous! 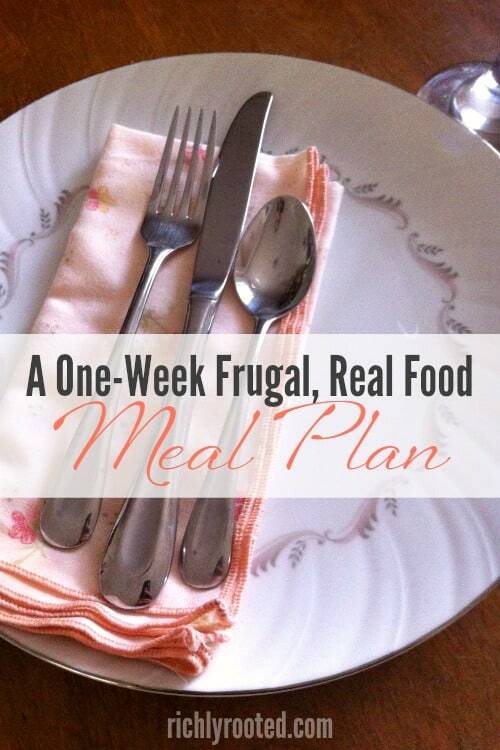 When you want to save a little time, try out this ready-made meal plan. 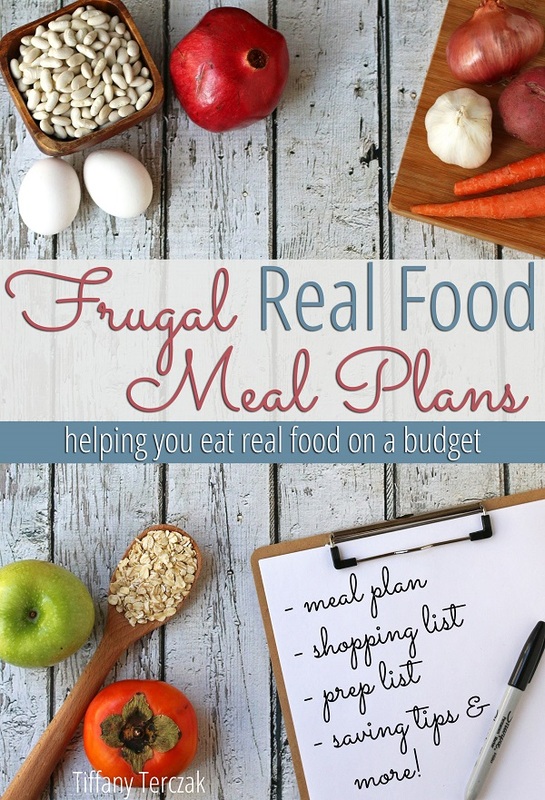 For ongoing meal planning inspiration (tailored for families who want to save money), I would check out Frugal Real Food Mean Plans from Don’t Waste the Crumbs. Breakfast – yogurt bowls with nuts, fruit, oats, etc. 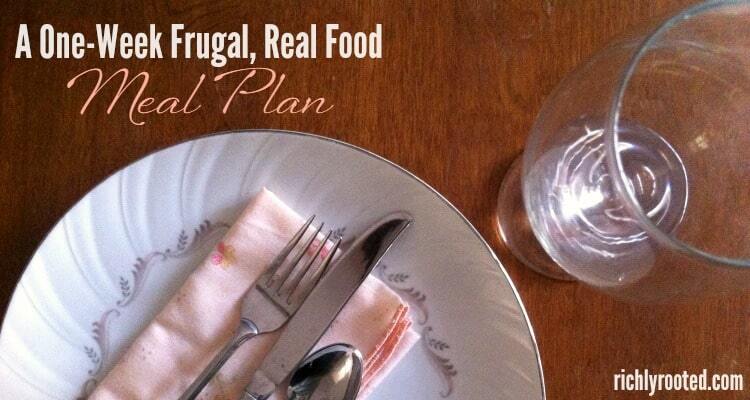 What frugal meals make it onto your meal plan? Feel free to share a link in the comments! I have a post coming out Saturday that is along these same lines. Great minds think alike. Oh, awesome! 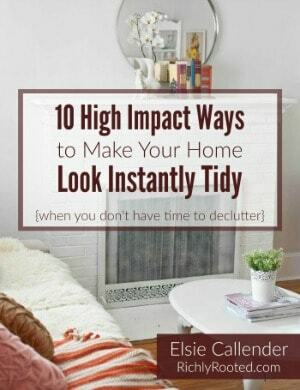 I will check that out!